Many states have long histories of appeasing terrorists. Egypt and Italy, for example, let Abu Abbas flee their countries. France has often let go of terrorists or struck deals with them. Until recently, Britain had a very mixed record. Even Israel, the nation that had carried the banner for toughness toward terrorists suddenly caved in to them in May 1985, when it traded more than 1,150 prisoners, many of them convicted criminals, for three Israelis captured during the Lebanon war. At one blow, almost every terrorist caught over the previous fifteen years was freed. 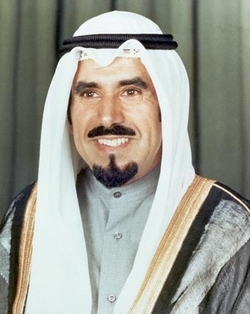 Jabir al-Ahmad al-Sabah, the ruler of Kuwait. Now President Reagan has confirmed that the United States has tried appeasement; Washington sought to buy back American hostages in Lebanon by sending arms to Iran. This raises the question: Is there any leader who consistently holds to the principle of not making deals with terrorists? There is, but he is not one most people would immediately think of: the ruler with the most principled record on the issue of terrorism is Jabir al-Ahmad al-Sabah, emir of the tiny Persian Gulf state of Kuwait. Consider the following: On Dec. 12, 1983, fundamentalist Muslims backed by Iran drove bomb-laden trucks into six targets. The most deadly of these struck the U.S. Embassy, killing five persons and wounding 62. Other trucks destroyed the French embassy and several Kuwaiti installations. The government arrested persons; in March 1984 six of them were sentenced to death, and the rest to prison terms ranging from five years to life. To free these prisoners, Iranian-backed radicals soon launched a series of attacks on the Kuwaiti authorities. To almost everyone's surprise, the government did not buckle. When terrorists hijacked a Kuwaiti airliner to Tehran, killing two, it held firm. When they drove a car into the Kuwaiti emir's motorcade, killing four, he responded by passing a tough anti-terrorism bill. When they planted bombs in two Kuwaiti cafes, killing nine, he imposed emergency measures and expelled 6,270 foreigners. Neither did the attempted assassination of a newspaper editor nor the sabotage of oil facilities win any concessions. Seeing that attacking Kuwait was getting them nowhere, the terrorists changed tactics. They made the freedom of American hostages held in Lebanon conditional on the release of the prisoners in Kuwait. According to the Kuwaiti media, this tactic had some success; last year, the U.S. government pressured Kuwait, through the British negotiator Terry Waite, to release the terrorists held in Kuwait jails. Many months before the world learnt of American deals with Iran, Kuwaitis knew that repeated public vows never to reward terrorism to the contrary, Washington was privately pleading with Kuwait to spring convicted killers. And the Kuwaitis did not like this. The newspaper Ar-Ra'y al-'Am scolded President Reagan making promises to the families of American hostages. The paper addressed Reagan: "Have you forgotten that you are the chief advocate for combating terrorism in the world? . . . If we agree to exchange the sentenced prisoners in Kuwait for your hostages in Lebanon . . . you become an encourager of terrorism." This bitter commentary declared that Kuwait's honors not available for the U.S. to barter. Another newspaper, As-Siyasa, protested that Washington was trying to violate Kuwaiti justice. Al-Anba' proclaimed that Kuwait "will not submit to threats and will not accept pressures of any kind." In contrast to the empty bluster of American officials that "you can run but you can't hide" and "no negotiations with terrorists," the Kuwaitis stayed true to their principles. The Interior Ministry categorically refuses to connect the fate of terrorists in Kuwait to events occurring outside the country. The simple but forceful attitude of "no bargaining with terrorists and no mercy to those who tamper with Kuwait's security and citizens" has been steadily upheld. Many Arab rulers have a deserved reputation for supporting or abetting terrorism; as The New Republic observed in an editorial earlier this year, "terrorism has been part of the routines of Arab political life for years." The emir of Kuwait is not only an exception to this depressing pattern, but a model for leaders in such countries as Israel and the United States. He represents true Arab honor. Let us emulate his example and try to repair the damage of the arms deals with Iran. This means returning to a strict policy of punishing the captors of Americans, not bribing their patrons in Tehran.